Written and directed by Rachel Ward, Beautiful Kate revolves around a family secret that is brought to the forefront when distanced son, Ned Kendall (Ben Mendelsohn) returns home after a number of years of absence with his girlfriend to see his dying father Bruce (Bryan Brown). Although his sister Sally (Rachel Griffiths) has open arms for her brother, their father treats this reunion with a touch of spite which once again reunites the memories that Ned has kept to himself all these years. The visit to his old family home causes Ned to reminisce and more specifically about the "close" relationship that he had with his twin sister Kate (Sophie Lowe) and discovery about the secret about his older brother Cliff (Josh McFarlane). This causes a plethora of emotions to be unleashed by Ned, most or all aimed at his father for how this situation was handled and how Bruce treated his family. 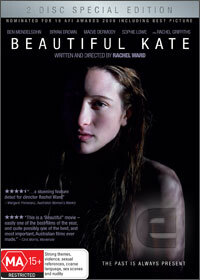 Although predictable at times, Beautiful Kate is quite a gripping and moving Australian film about a topic that many filmmakers avoid, however Ward has successfully managed to scribe the original American novel into a unique Australian setting that only makes the movie that ever so more powerful. The stars in the movie are of course Mendelsohn who is battling his own emotional demons and that of Bryan Brown who is quite hateful and is easily one of his most powerful performances to date. Apart from the powerful topic of this story, the cinematography truly transforms this film into its own that not only highlights the Australian outback but is used extremely well with the emotions and flow of this story. For first time director Ward, she has created a very powerful film that is almost perfect, except for one family's dark secret. Perfectly written, cast and directed, Beautiful Kate comes highly Recommended!